Great post! One that all adults need to read. We need to keep up with the kids in communicating, b/c they are going to be our leaders at much younger ages and if we want to know what they are up to, we need to be able to speak their language. I tweeted it and am going to share on FB too! Have a great week! Thanks so much, I’m glad you liked it. Brilliant post, Deanna! So, so true. However, as a former college instructor, I can guarantee that professors can tell when students are texting–as least I could. Happy Monday to you, my friend! I totally agree, Deanna…as the parents of four “plugged-in” teenagers, we monitor their interactions pretty closely! Great post! You wouldn’t let your kid have 20 strangers over for a slumber party, so why would you give them free reign to communicate with a WORLD of strangers on the internet? Cool post, Deanna. 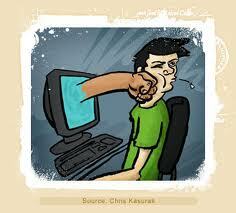 Thanks for sharing and showing that I am not the only one who is concerned towards the issue of cyber bullying. You have a point that we as adults can not only choose to be well-versed with technology and social media but also we can educate kids about safe and responsible use of cyber space. Cyber-bullying seems to instensify both the bullier and the consequences, and is clearly something that needs much attention paid to it. Thanks. Marathon Memories of Boston If the Joshua Tree Falls In the Desert, Does Anybody Hear it?